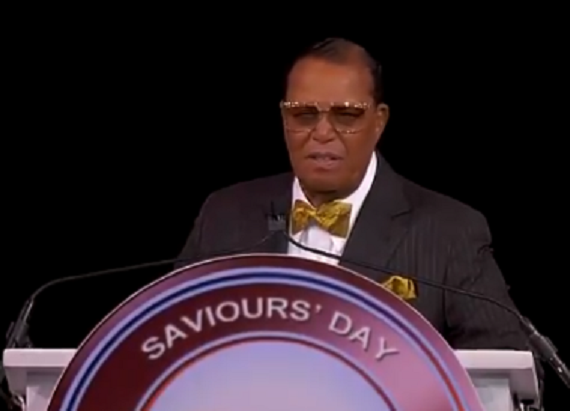 “God so loved his people that he gave his only begotten Son that whosoever believed in Him would not perish but have everlasting life,” Farrakhan began, quoting John 3:16. Then, he relayed to the crowd at the United Center arena in Chicago what he believes is the truth. “God does not love this world. God never sent Jesus to die for this world. Jesus died because he was 2,000 years too soon to bring about the end of the civilization of the Jews. He never was on no cross. There was no Calvary for that Jesus. “Early one Saturday morning our savior taught us, when he found out he was 2,000 years too soon to end the civilization of the Jews, He decided that he would give his life for the truth that he taught, that His name would live, until the one that he prefigured came into existence. And that’s why the Koran says Jesus and his mother Mary were a sign. On Twitter: God does not love this world. God never sent Jesus to die for this world. Jesus died because he was 2,000 years too soon to bring about the end of the civilization of the Jews. He never was on no cross. There was no Calvary for that Jesus. Jesus was out there after he had the largest crowd that he had in all of his 20-something years of teaching in Jerusalem and in Palestine.He had 35 people. The Roman soldiers came and when they saw him the soldiers, two of them, they ran toward him. He never moved; he came out on the street to die.That’s my Jesus the prophet. And when they put their hands on him they started arguing because there was a price on his head $1,500 if you bring him in alive $2,500 if you bring him in dead. … So as the soldier that had him was walking with him to bring him to the authorities, the solider was saying, “Look, Jesus, if I bring you to them, they’re going to torture you; but if you let me kill you, I will do it so quickly that you won’t hardly feel it.” And Jesus, according to what our Saviour taught us, he invited them to come and do it. He had his hands in this manner, arms open, in front of that Jew’s store. The Roman soldier took his knife and drove it into Jesus with such a force that his nerves just froze, and he was in this position, arms open, when he passed. He’s been embalmed to last for 10,000 years. You can believe it or let it alone. The real story is what I tried to tell you from the beginning. It didn’t happen back there. It’s happening right while you’re alive looking at it. I represent the Messiah.I represent the Jesus and I am that Jesus. If I am not, take my life.